ANDREW PRITCHARD capped a superb round with an eagle at the last hole to win Huddersfield GC's March Open Stableford. Four-handicapper Pritchard carded five birdies as well as the closing eagle to tally 43pts and win both overall and Division One honours. He amassed 20pts on the way out, marginally hindered by two one-pointers, but added a further 23pts coming home. The eagle earned him four points as did a birdie, net eagle at the 14th. Second place went to John Lamb (handicap 13), who was edged out on countback, his par at the last for two points proving crucial in Pritchard's favour. Lamb had four net birdies for an outward 22pts and three more for 21 on the back nine. Consolation was his in the form of winning the Division Two category. Division Three was won 16-handicapper David Anderson with 40pts. He began with four net birdies in his first five holes, added another at seven and reached the turn with 21pts. He then stumbled with three consecutive one-pointers from the 10th, but recovered superbly to put together another spell of four birdies in a five-hole stretch, from the 13th, and came home with a 19pt tally. Sixteen-handicapper Richard Bell won overall and Division Three accolades in Saturday's Stableford at Huddersfield. He totalled 40 and won on countback from two other players with the same score - Hamish Ogilvie (13) and Mick Darby (21). Bell had two net birdies on the way to the turn for 19pts and his 21pt homeward tally was built on four net birdies in five holes from the 11th. Division One was won by Peter Rayner (eight) with 38pts, compiled with the help of three gross birdies. 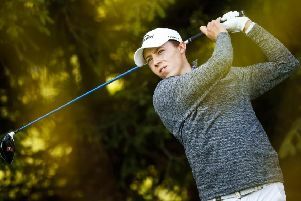 Ogilvie secured the Division Two honours with his 40pts, his round including two four-pointers in three holes with gross birdies at the par-3 fourth and the par-4 sixth. Division One of Hessle GC's Pro's Individual Stableford was won by Andrew Dibnah with 40pts, two ahead of runner-up Patrick Hooley and third-placed Paul Gainey. Richard Anderson was an emphatic winner in Division Two with 45pts, six clear of second-placed Paul Davison and Neville Kingswood, who was third. Branshaw GC's Easter Scramble was won by Ryan Thornton, Grahame Webber, Gillian McAndrew and Tony Fairclough (56.9). Runners-up were Terry Long, John Thornton, Grahame Williams and Peter Myerscough (57.3). Third were Keith Jowitt, Alec Leeming, Ian Kennedy and Les Greenwood (58.8). Prize for nearest the pin at the 13th went to Ricky Buxton.